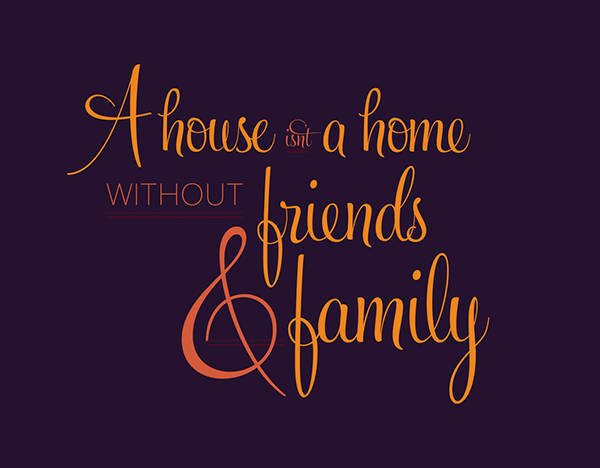 A housewarming is a party that is traditionally held after a family moves into their new house. Setting foot in a new residence is always a memory that should be cherished for a long time. 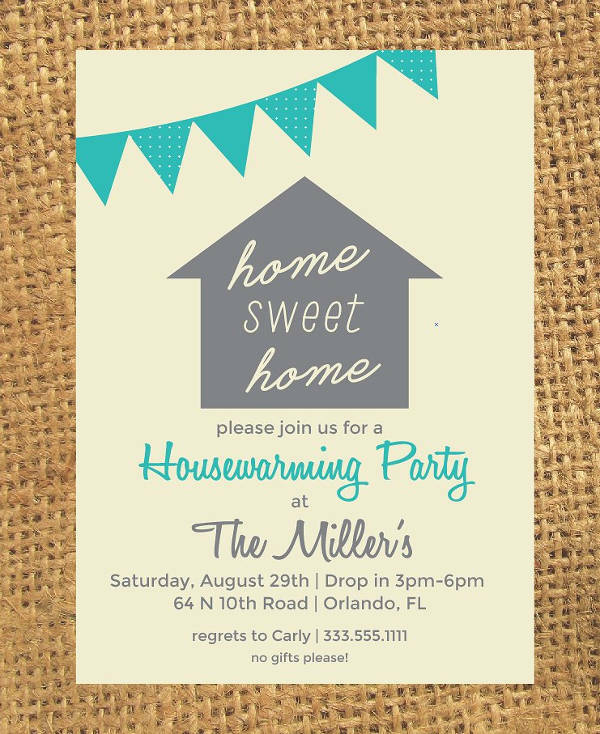 So, if you are going to host a housewarming party anytime soon, it’s quite natural that you will need an invitation. 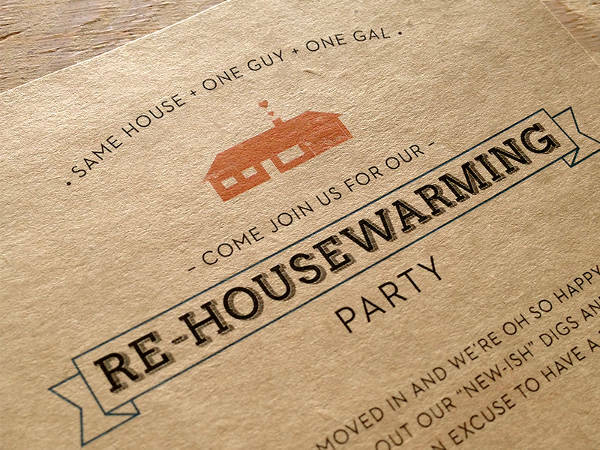 So we have here collected a list of the most fabulous housewarming Invitation Designs that you would love to use. 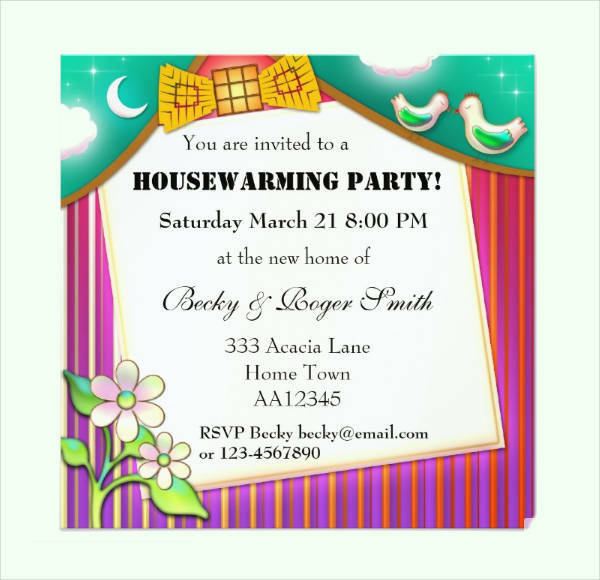 Download Housewarming Party Invitation is a simply designed invitation card that you can use. It has got ample space for you to insert in your details. You can even change the color, texts as per your preference. You may also see Free Invitations. 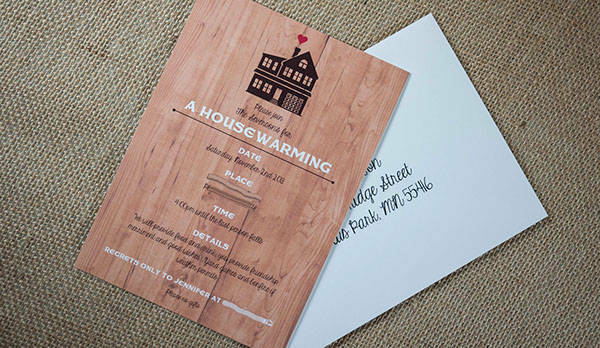 Free Housewarming Invitation is an attractively designed card. 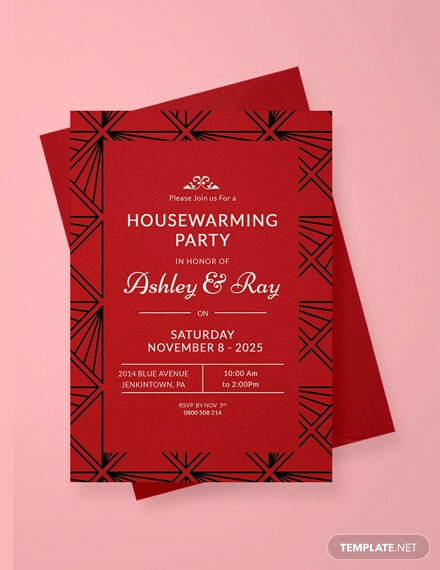 If you are not looking for a flashy invitation card, you should go for this Free Housewarming Invitation for the occasion of your housewarming party. You may also see Party Invitations. 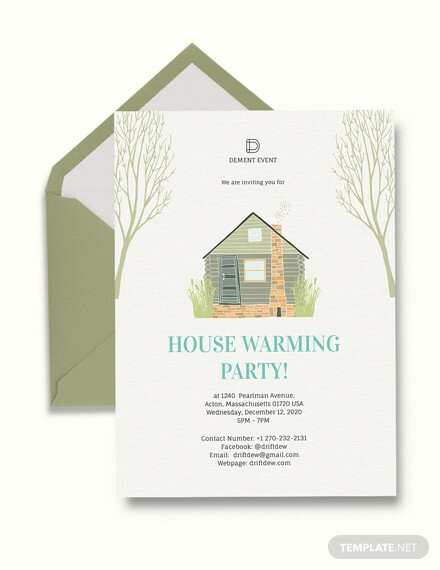 Printable Housewarming Invitation is a creatively designed invitation card, and it is available in 5″x7″ size, and you can get it on matte or gloss paper. You will get envelopes too with this print-ready, high-resolution invitation card template. You can also check the Housewarming Invitation Ideas. 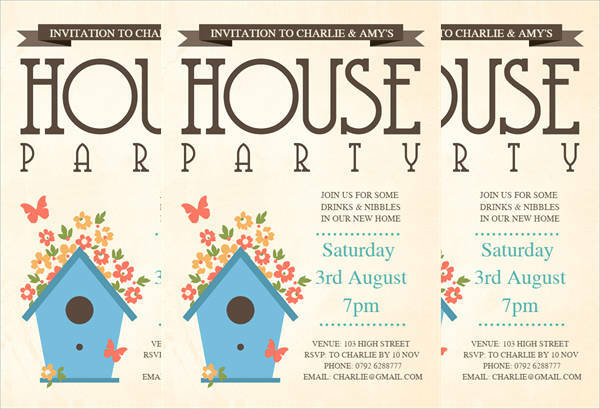 With this PSD Housewarming Invitation template pack, you will get a PSD file and use this file you can customize the invitation as per your liking. You will also get two different invitation card designs with this pack. 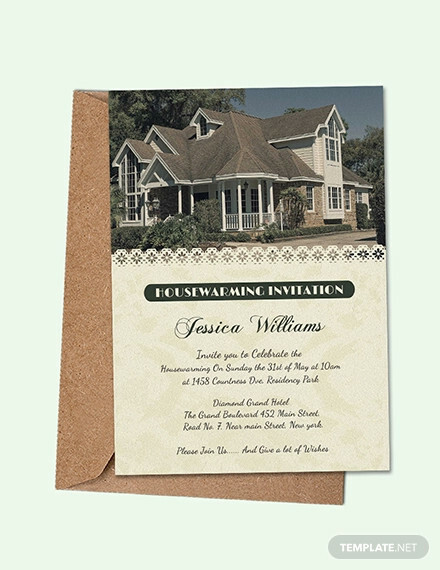 Housewarming Invitation Design is a thoughtfully designed template, and it suits the demand of the occasion i.e. your housewarming party. You can download, customize this template and once you are done with the customization, you can take as many printouts as you want. Are you looking for an offbeat and differently designed invitation card template for your housewarming party? 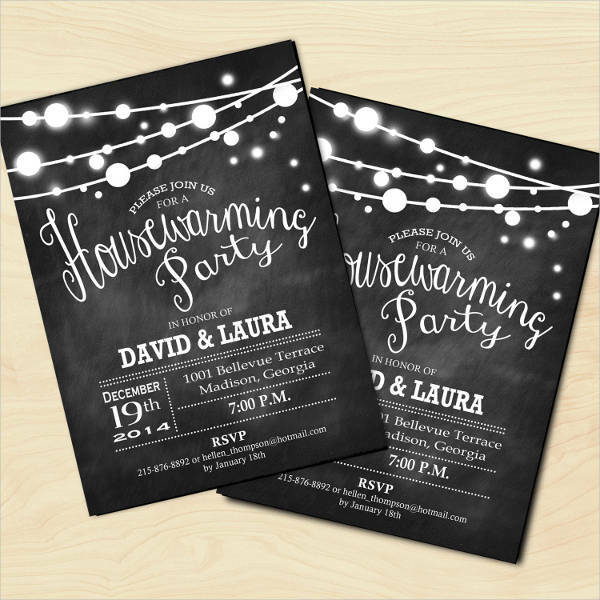 The, you must take a look at this Chalkboard Housewarming Invitation template. 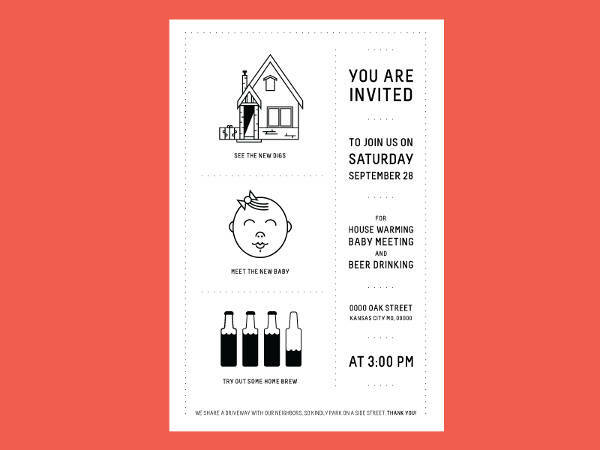 Use this invitation template to create a stunning invitation for the party. 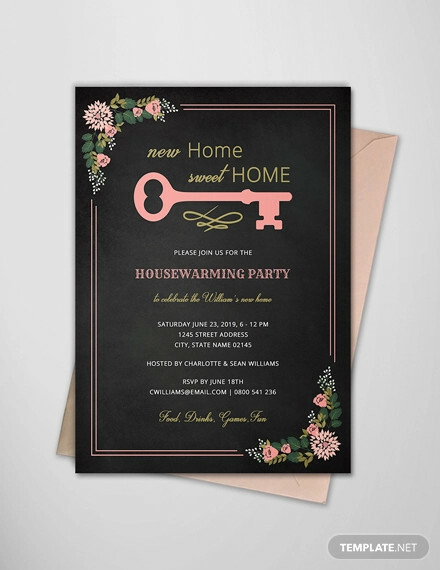 Fully Editable Housewarming Party Invitation is an elegant looking invitation template, and you can customize all the design elements like the background color, texts, etc. to create an awesome invitation card. If you intend to add a funny quotient to your housewarming party invitation, download this Funny Housewarming Invitation and create an invitation that will make your guests smile when they receive your invitation. 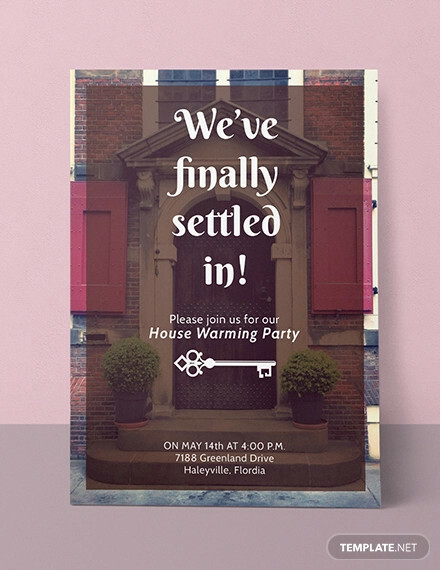 Free Housewarming Party Invitation is an artistically designed invitation template that you would love to use for your housewarming party. This template is available in high-resolution, and you can customize it if you feel the need to. 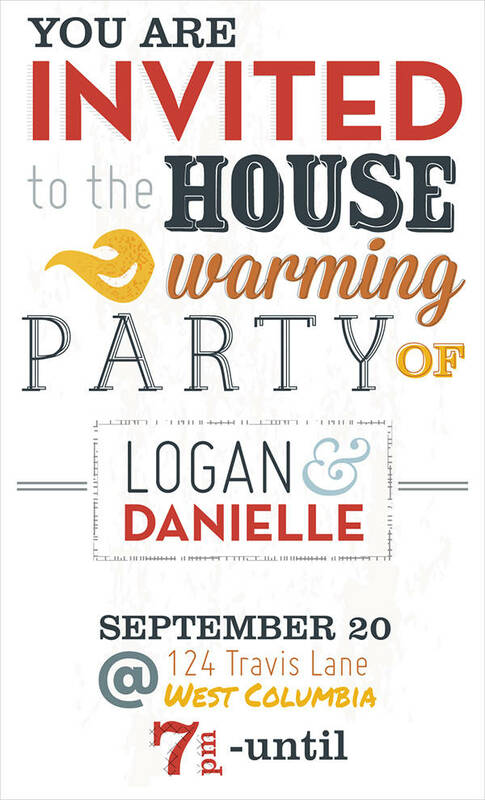 Use this beautiful Print Housewarming Invitation to create invitation cards to announce the monumental occasion of your housewarming party and invite your loved ones. This invitation template is available in 5.25”x5.25” size. 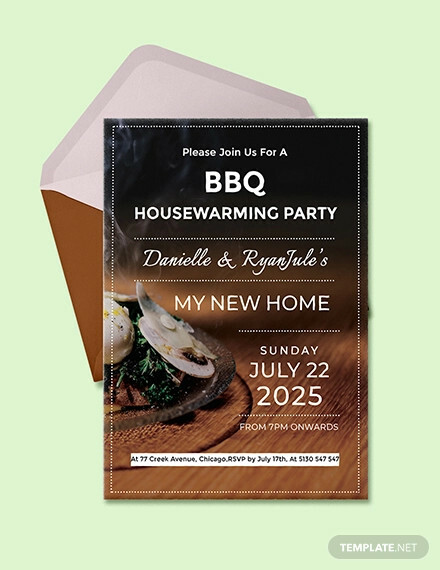 Download this Diy Housewarming Invitation card template and invite all your family and friends to share the joy of moving into your new home. This invitation template is available in high-resolution, and you can bring in changes as it is a fully customizable template. 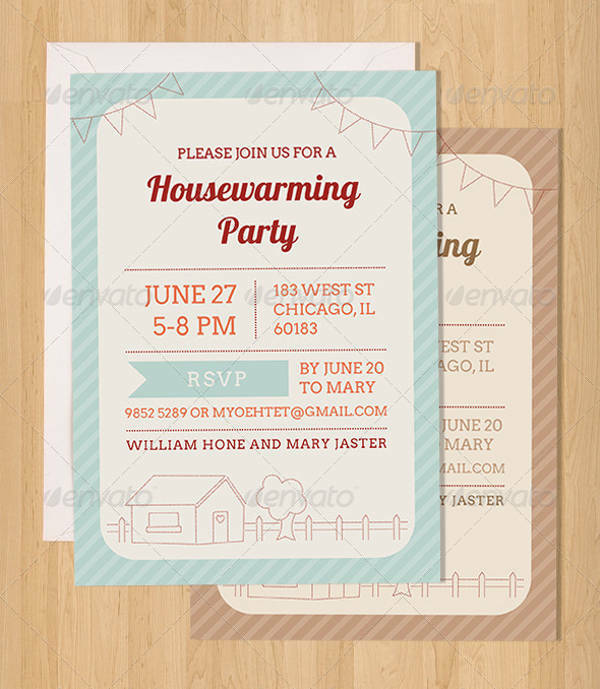 Colorful Housewarming Party Invitation is a simple and stylishly designed template that you would love to use to invite your guests over for your housewarming party. It is available to be used both in physical as well as a digital form for your convenience. If you are planning to create an invitation to impress your guests with its marvelous look and feel, you should better opt for this Simple Housewarming Invitation template. 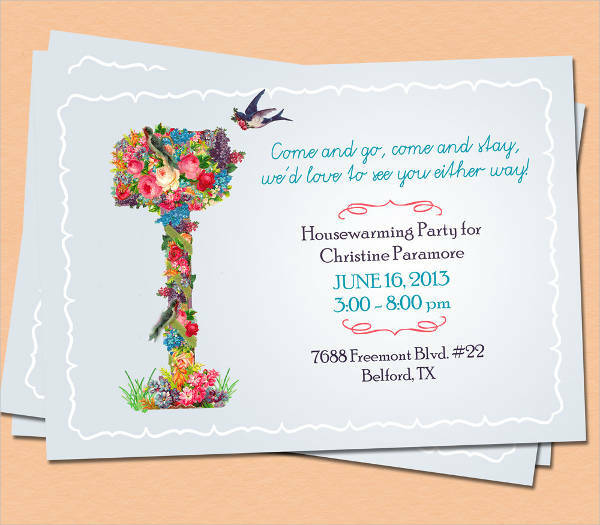 Housewarming Party Invitation is an invitation card template with a beautiful floral design. 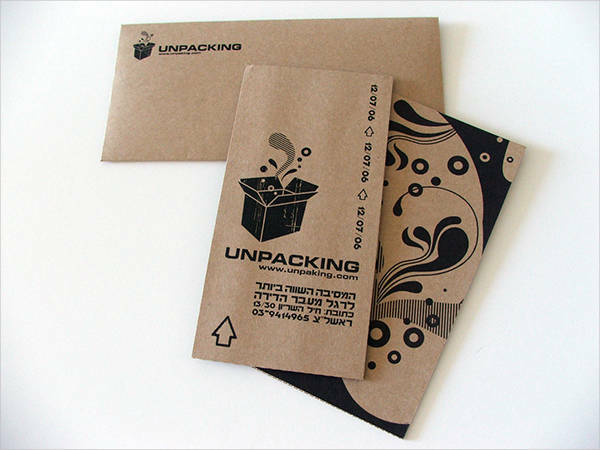 It is available in 5″x7″ size and it is perfect for emailing or photocopying. You may also check the Free Housewarming Invitations. 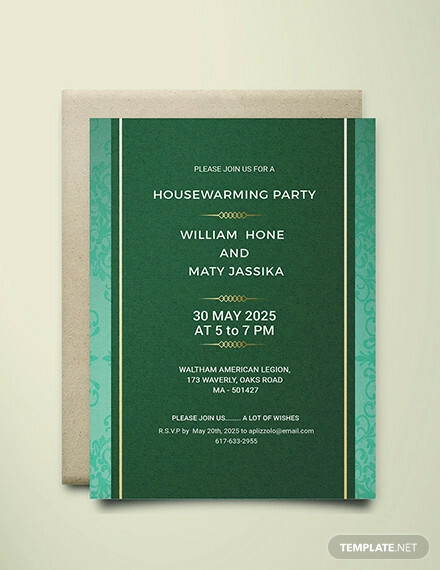 Housewarming Invitation For Free is a modern invitation card design, and it will be an appropriate selection of invitation card for your housewarming function. You can make further modifications in this template to your liking. 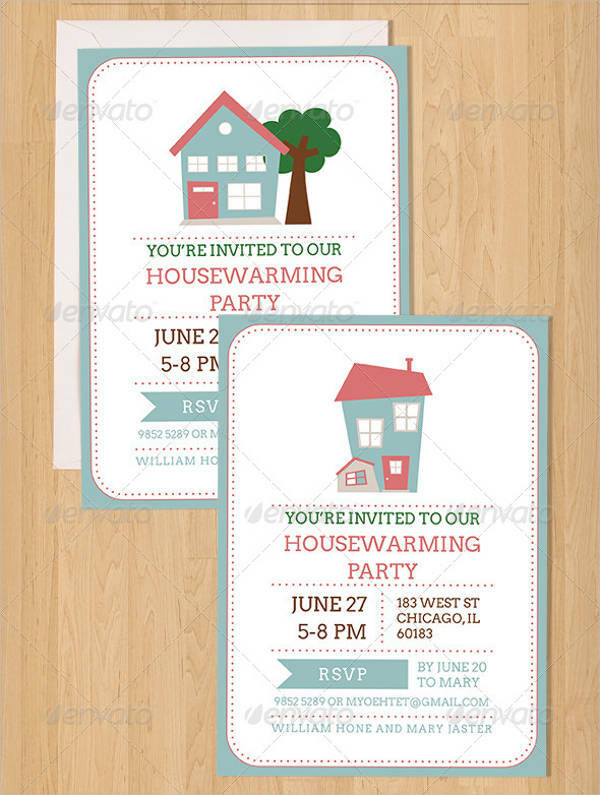 How to use these “Housewarming Invitations”? Moving into your new house can be stressful, but your invitation for the housewarming party doesn’t have to be stressful at all. The Unique Housewarming Invitation Designs as mentioned above presents you with awesome invitation designs for you to choose from and you will be spoilt for choices here. These templates will provide you with an opportunity to bring out the creative genius in you as these templates are fully customizable and you can design an invitation card that will be loved by one and all. You may also see Family Reunion Invitations. 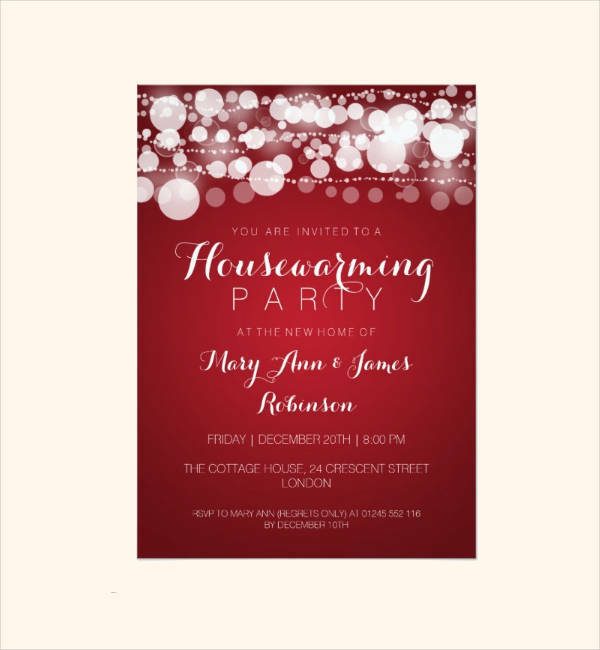 We have a vast collection of Housewarming Invitation Designs on our website, and they will take away your stress of designing an invitation on your own from scratch. You will get readymade designs, and all of them are stunningly designed to suit the requirement of your occasion perfectly. 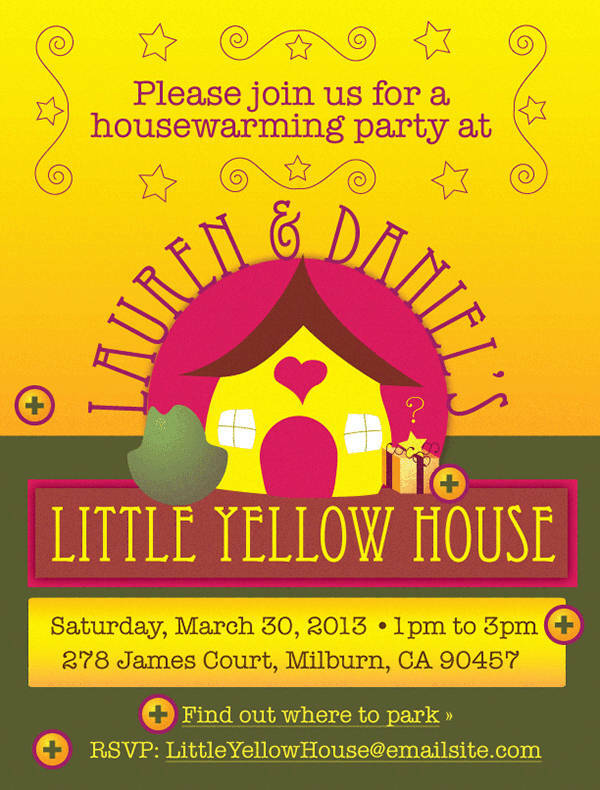 Download these designs and create invitations and have an unforgettable housewarming party.